Wondershare's MobileGo for Android offers almost all of the features found in iTunes—and a few you won't find anywhere in Apple's software. So Android users, you can banish your envy of the symbiotic relationship between Apple’s mobile iOS device and its iTunes desktop software. MobileGo is available in a free version that's available for Windows PCs and a $40 Pro version that's available for Macs, too. MobileGo Pro features a panel that displays details about your Android device, while the center part of the screen gives you a general overview. The free version of MobileGo offers basic Android management features, including the ability to backup your phone's contents (including SMS messages, apps, and contacts) and allows you to transfer contacts and multimedia files between your phone and PC. It also allows you to manage apps and send and reply to text messages from the computer. The Pro version adds more useful features, including the ability to convert audio and video files to a compatible format before transferring them to your phone, the ability to sync iTunes playlists to Android, and the ability to import and export contacts to and from Outlook and Windows Mail. It's just unfortunate that you have to pay $40 to access these features, when iTunes is free, though admittedly it doesn't offer all of this functionality. If you can get past the price tag, you'll find MobileGo Pro for Android is an attractive, easy-to-use application. MobileGo Pro's interface has been redesigned in version 2; I found earlier versions just as easy on the eyes, but the new look manages to make all of the applications features accessible within a click or two. To get started, you install the software on your computer and connect your Android device. You can connect it via USB or, new in version 2, via WiFi. You can establish a WiFi connection by opening the MobileGo app on your phone (it installs automatically once you connect your phone to MobileGo) or by scanning a QR code that the application displays on your screen. 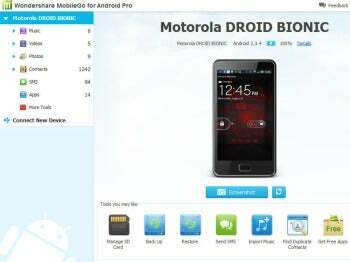 MobileGo recognized my Motorola Droid Bionic right away, and within seconds displayed an overview of its contents. A panel on the left side of MobileGo's interface listed the number of songs, videos, photos, contacts, SMS messages, and apps on the device; clicking on any of these categories opens a more detailed window in the main part of MobileGo's screen. I like how easy it is to read SMS conversations and to see contacts by group—managing these things is much easier done on a big PC screen instead of a relatively small phone sometimes. From MobileGo's homescreen, it's easy to access many of the application’s other features. With just two clicks I was able to create a complete backup of my phone, and with three clicks, I was ready to import an iTunes playlist. Transferring video to my phone was a breeze, too, as I was able to convert and transfer a 30-minute television show over to my phone in minutes. MobileGo Pro for Android offers an easy and attractive solution for managing Android devices. It would be nice if the Pro version were a bit cheaper, but you do get a full-featured application for your money.